The Auburn choir and the Ad Hoc Singers will take part in this sequence of words and music. The Cantata Singers featuring soloists Suzanne Johnston and Thomas Dalton, conducted by Peter Bandy. A concert of music from the Broadway musicals of Rodgers & Hammerstein, Irving Berlin, Cole Porter and others. Flyer. Tickets $25, children under 12 are free. 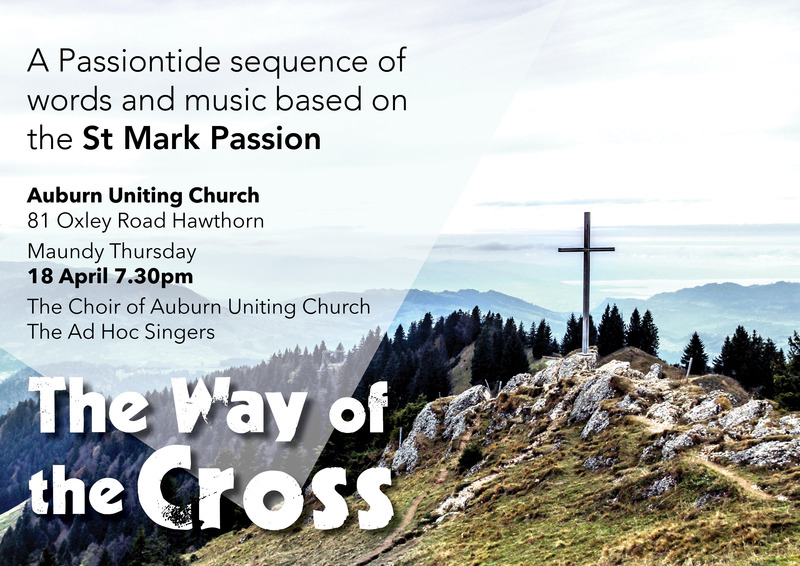 A programme of choral music in Auburn Uniting Church. Bookings now open. Eva-Marie Middleton, an opera singer from Perth will be accompanied on the organ by her husband Dominic Perissinotto, Organist and Director of Music at St Patrick's Basilica, Freemantle. Tickets available online at www.trybooking.com/BBRXI or at the door. Coffee Morning Meetings are held 9 times a year on the first Thursday of the month: March-November. The next meeting is on Thursday 2nd May 2019 at 10.15am. The topic is "Percy Grainger: Musician and Collector Extraordinaire". The speaker is Mr Roland Yeung, and Grainger's music will be presented by Merlyn Quaile (opera singer) and Bruce Macrae (pianist). 6th June: Professor Steven Williams "An American in Melbourne"
4th July: The Rev. Professor Emeritus Robert Gribben AM "Charles - the other Wesley". It was a beautiful day and the next Tower Open Day is planned for Sunday afternoon 22 September 2019. It was a cloudy day and we hope for sunnier weather next time. There are also panoramic photos taken from the Tower Viewing Deck on display at the 3rd level of the tower. Auburn Uniting Church is a congregation of Uniting Church in Australia. Copyright © 2017 Auburn Uniting Church – All Rights Reserved.